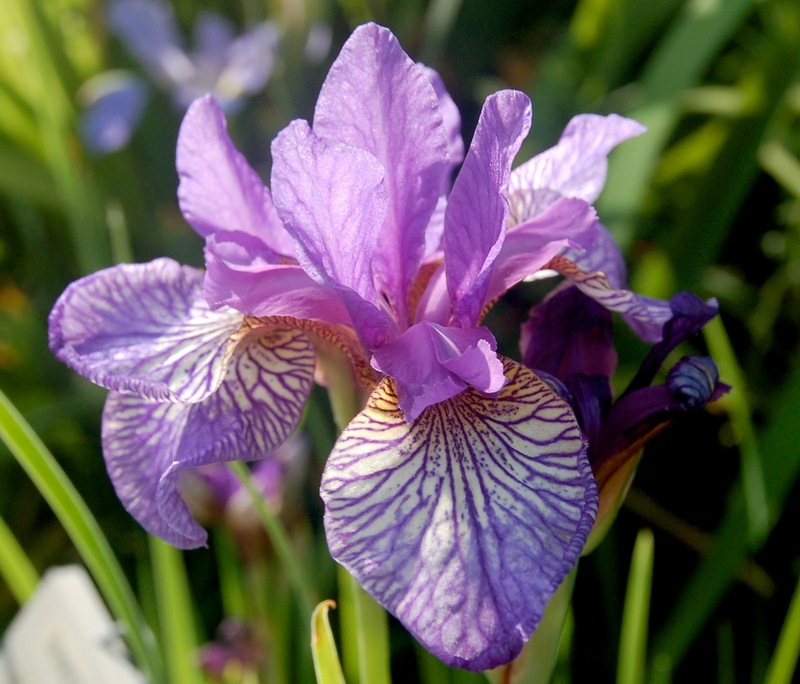 The quest for a red iris has been at the forefront of many hybridizer's work since the beginning of hybridizing. One of the most important varieties in the history of red irises is the sublime 'Cardinal' by A.J. Bliss. Introduced in 1919, 'Cardinal' is one of the early tetraploid irises, a child of 'Trosuperba' crossed with the famous 'Dominion'. 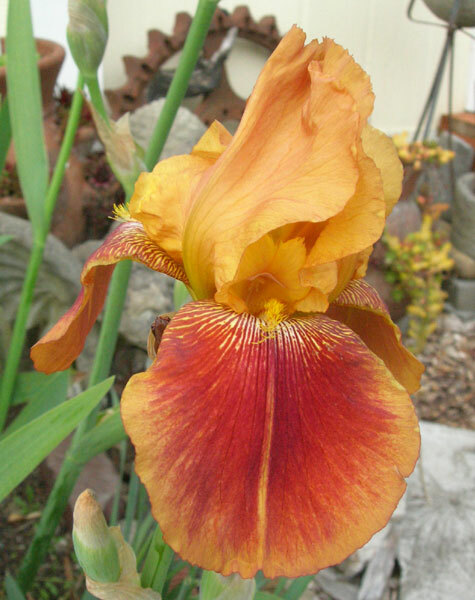 Tho not a red iris itself, it was very popular with iris growers and was heavily used in hybridizing for red tones. 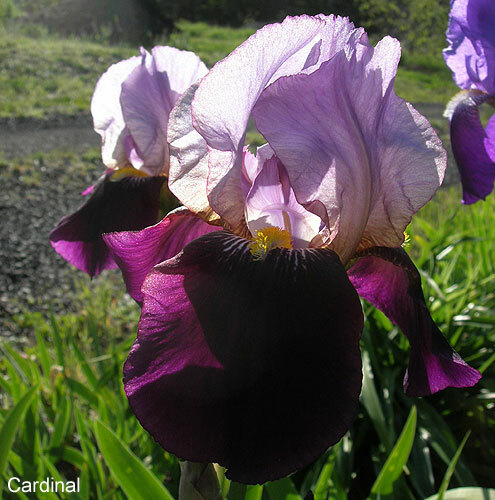 'Cardinal' is a tall bearded iris, around 40 inches in height, which blooms mid-season and stays late. "Dominion Seedling. One of the richest flowers of the Dominion race that carries the perfect form and velvety texture of its parent to greater height on low and widely-branched stems. S. a distinct shade of lavender, overlaid with rose, erect and arching inward at the top; F. rich raisin-purple, very broad and rounded, and of wonderful glossy texture. 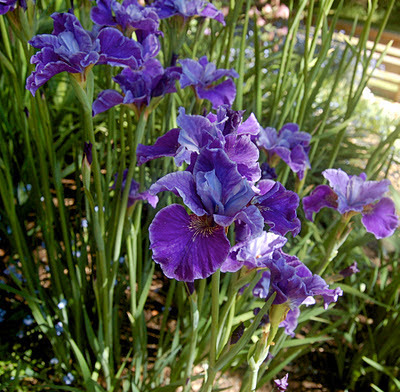 A rich, bright Iris that gives a beautiful color effect with transmitted light." "S. lavender overlaid rose, broad and beautifully arched. F. circular, rich prune purple, very velvety. Wonderful texture, and spledidly branched. Grows well and is extremely floriferous. Many consider this Dominion seedling the best Iris in the world. It is certainly one of the most sought as the supply cannot catch up with the demand, in spite of the price remaining around $20.00." Arthur John Bliss lived in a small and out-of-the-way village known as Morwellham, in the west of England. 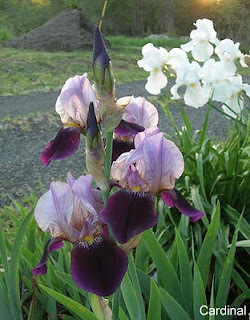 He retired early due to deafness and spent the remainder of his days gardening and hybridizing irises. His 'Dominion' is widely considered to be responsible for the tetraploid revolution in bearded irises of the 1920's. Mr. Bliss made many beautiful creations, and 'Cardinal' was one of his most beloved. You can see why. The color is delicious, the flaring form perfectly lovely, it is hardy and vigorous and it blooms for a long period. 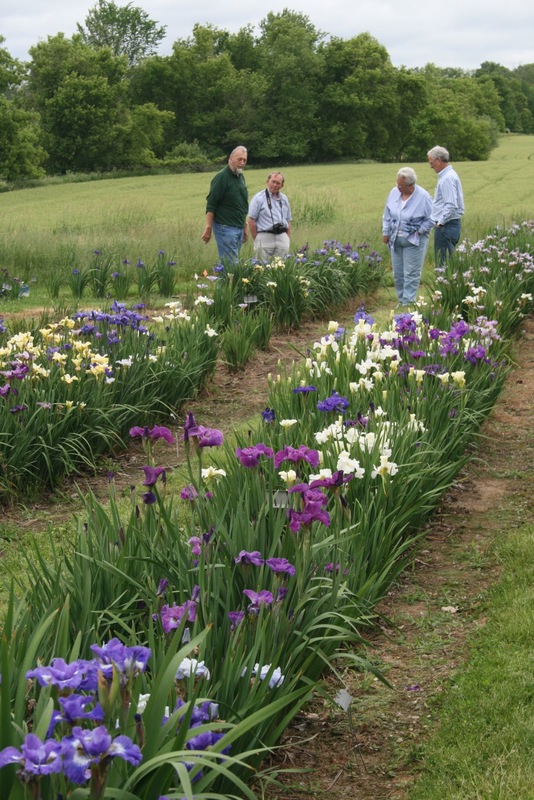 It has left a rich legacy in the history of irises and has been in the background of many top award winners thru the decades. 'Cardinal' is truly an iris classic - as good today as it ever has been. From its inception until the disruption of the World War II, the Cayeux firm lead the world in advancing the form, patterns and colors of bearded irises, leaving no doubt that Ferdinand Cayeux was one of the most influential iris hybridizers of the 20th century. Having trained under his father's apt tutelage, Ferdinand had taken on the work of iris hybridizing in his own right by the early 1920's, continuing a legacy of quality and artistry that the Cayeux et LeClerc firm was famous for. One of his most renowned is the exceptional 'Madame Louis Aureau', a gorgeous plicata with a silvery white ground margined deep heliotrope. The intensity of the banding varies from year to year with the fertility of the soil and the season's fluctuations, but it never fails to bloom and is always beautiful. A vigorous grower, hardy everywhere and with perfect ruffled form, this one has been a favorite of gardeners since its introduction in 1934, and is still a favorite with historic iris collectors. "Standards are lovely soft rosy heliotrope on translucent silvery white ground. The falls are banded and veined at margin with the same degree of color which gradually shades toward the center." The heart of the flower is lit with the soft golden yellow of the styles, and there is nothing like it when the sun plays thru from behind. A very reliable and early bloomer, it often leads off the Tall Bearded season in my garden. It also has the excellent trait of a large bud count, ensuring our enjoyment for a long period. It is a child of 'Fakir' X 'Ferdinand Denis', and won an Award of Merit in 1939 and the French Dykes Memorial Medal in 1934. 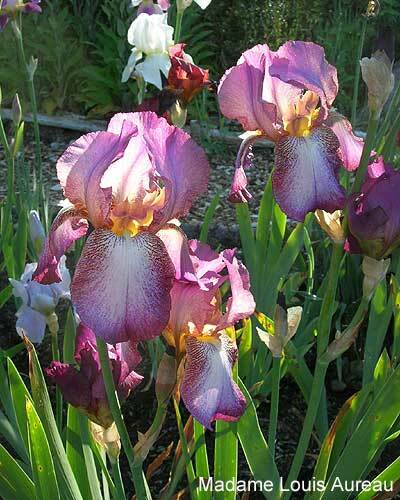 'Madame Louis Aureau' has one more notable aspect that makes it a true iris classic in every sense - it's legacy. As one of the most widely used parents in advancing the plicata pattern in irises, almost every plicata today can trace its ancestry back to 'MLA' - it often appears multiple times in a single pedigree. 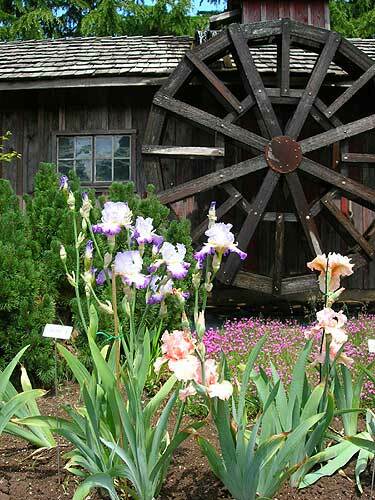 It has indeed left its mark on iris history, and is still a worthy garden iris in its own right. So the next time you are admiring a lovely modern plicata give a little thought of thanks to the remarkable creations of Mons. Ferdinand Cayeux and the unforgettable 'Madame Louis Aureau'. I don't know about you, but if I had a choice, I would live in two places. I would of course stay here in the Southern California area, but my second place would be at a location where I could grow Siberian irises. I just love them. They are so delicate and so different than their tall bearded cousins. Being in a warm-weather location has limits to what I can grow, and we don't get that cold punch that many iris growers talk about. Even though I have tried to grow Siberians, they do grow and bloom, but very poorly compared to other areas of the country. I've noticed that the stems and blooms are smaller, plants are less floriferous, and they require more water than I'm used to providing to the rest of my garden. In any case, I have grown a few, but with dissatisfying results. 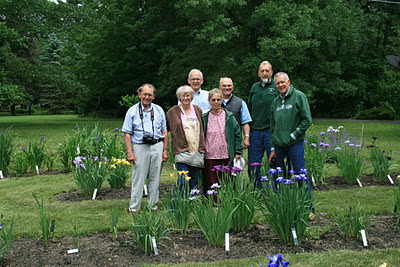 Here comes the good news, in 2012, the Lansing, MI area is hosting the Siberian and Species Iris Convention, called 'A Capital Idea.' Click here for more information. I think it's going be a wonderful event to attend because of the many Siberian and iris species many of us would never have a chance to see. Convention headquarters: Causeway Bay Hotel and Convention Center located in Lansing, MI. Ensata Gardens located in Galesburg, MI is home to more than 180 Siberian varieties, about 450 Japanese varieties, and a host of daylilies and hostas. After viewing the guest Siberians and Species enjoy a stroll through their relaxing gardens and be sure to check out the koi in their ponds. Jim & Jill Copeland‟s garden is located is Lawton, MI. They have a beautiful winding ribbon of Siberian & Species iris waiting for you as you enter their garden. After viewing the guest iris, those who are adventurous should checkout their seedling garden on the backside of their property or a bit closer is Jill‟s restful shade garden. John & Jean Kaufmann‟s garden located in the Lansing area houses the TriCounty Iris Society‟s TB iris in addition to John‟s experimental herbicide plots. There should be plenty of bloom for all to enjoy.Bob & Judy Hollingworth‟s gardens are also located in the Lansing area. The guest bed at the Hollingworth‟s home was originally laid out as a block S for an MUS welcome, but more beds were added for greater ease of viewing and the block S has become hidden. The Hollingworth‟s will also have a good display of hostas and Japanese primroses for all to enjoy. 'Ships are Sailing' growing in Salt Spring Island, BC. In addition, there will be a tour of Bob & Judy‟s farm where Bob‟s seedlings are growing. I'm so looking forward to attending this convention. I can hardly wait. 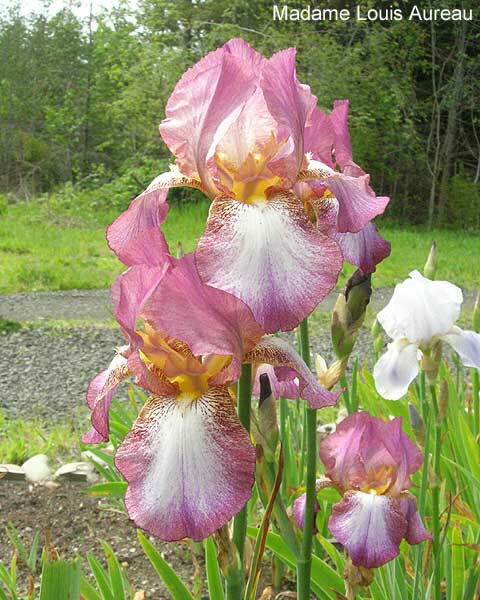 For more information go to the Society for Siberian Irises website. Photo credits: Group photos by Deb Diget. Siberians by Andi Rivarola. As of this month, October, 2011, Cooley's Gardens is officially closing its doors. Tho gone, they will not be forgotten. 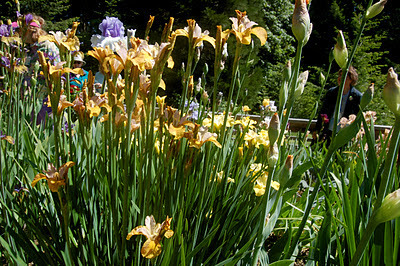 A legacy of iris hybridizing and introduction spanning eight decades is not so easily erased. Iris lovers the world over will continue to cherish and enjoy the varieties that are with us due to the efforts of the Cooley family and all their heirs that have lovingly kept the business going all this time. As well, historic iris lovers will continue to collect their beautiful catalogs, for which they were renowned. 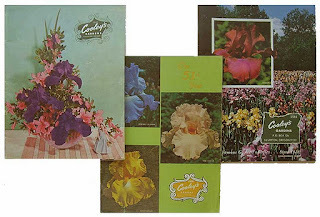 Cooley's Gardens started as a back yard hobby of Rholin and Pauline Cooley in Silverton, Oregon. They produced their first commercial catalog in 1928, and went on to become one of the largest iris firms in the US, lasting 83 years as of 2011. It has been continued by subsequent generations of the family, most recently by Rick Ernst and his wife Katie. Sadly, Rick passed away this past spring. 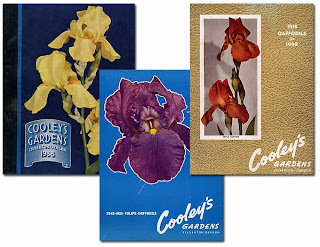 Cooley's was the primary introducer for many famous iris hybridizers. Early on, in 1929, Dr. Kleinsorge began introducing his illustrious varieties in their catalog with his beautiful 'Klamath'. 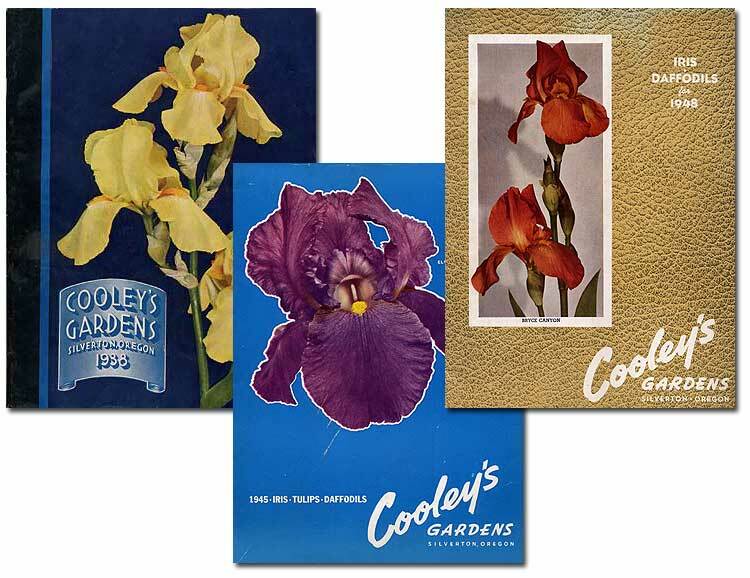 Cooley's continued to introduce almost all of his irises until his final varieties 'Bengali' and 'Buckaroo' in 1961. 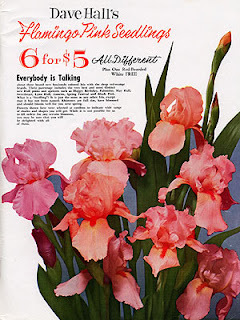 Another legendary hybridizer featured in Cooley's thru the 40's, 50's, and 60's is Dave Hall, most famous for his line of 'flamingo pinks' that so captivated the iris world, he also brought us many other new color breaks as well. Cooley's later brought us the work of master hybridizer Jim Gibson and his ground-breaking work with plicatas, as well as the award winning productions of Larry Gaulter. I was fortunate to have the chance to visit the beautiful display gardens at Cooley's during the 2006 AIS Convention. The garden was a mass of beautiful flowers and the fields stretched away into the distance - row after row in a dizzying rainbow of blooms. Visitors eagerly toured the display beds and admired the indoor floral arrangements for which Cooley's has been so famous over the years. All things must eventually come to an end, and Cooley's Gardens can rest assured of their place in iris history. We will always have their legacy, all the beautiful irises they created and those they introduced, to remind us of their contributions to the world of irises. 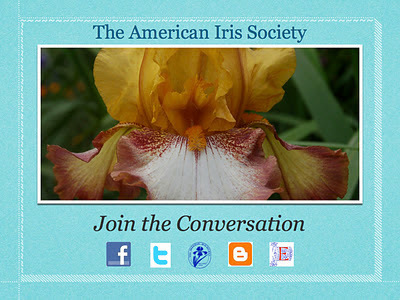 We're happy to let you know that The American Iris Society (AIS) just announced a new membership service - Electronic Membership. E-membership is separate from the normal AIS membership. 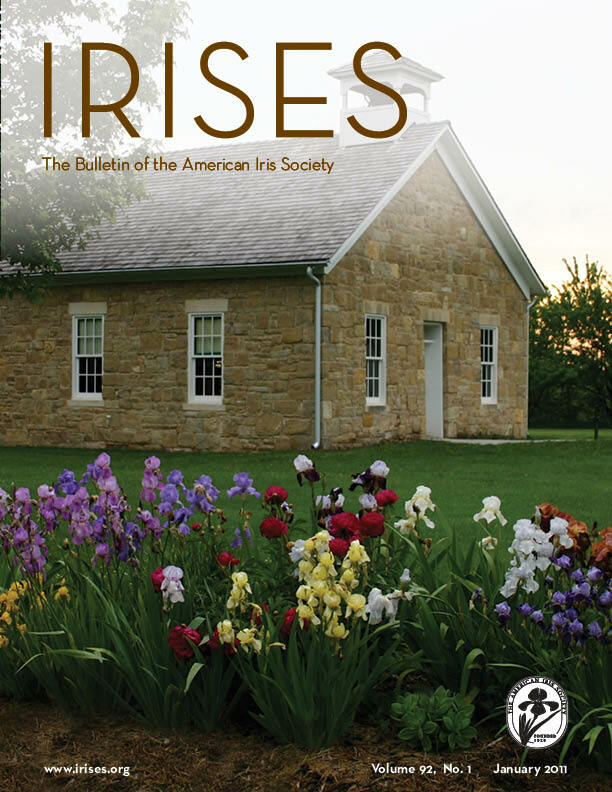 E-members do not receive printed copies of IRISES, the AIS Bulletin. 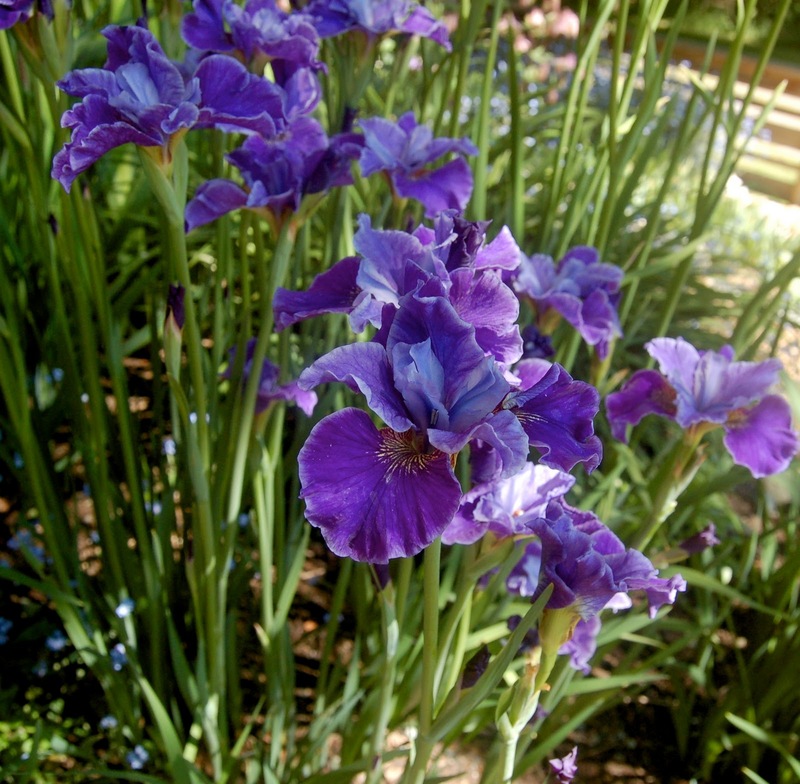 Instead, they have access to IRISES online using an easy to use viewer. E-members also have access to online viewing of The Basic Iris Culture booklet and automatic access to irisregister.com, the online iris registration database. Additional services may be made available in the future. 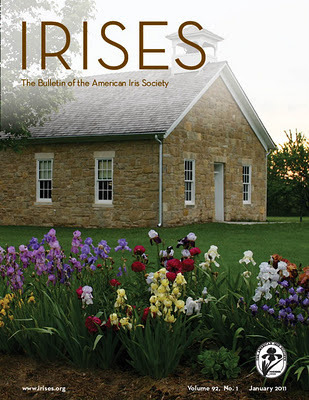 To view a sampling of the contents pages of The Basic Iris Culture booklet please click here. 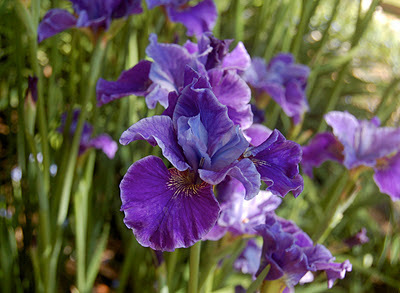 The AIS Registrar is the world wide registration authority for cultivated non-bulbous irises. The governing standard is the International Code of Nomenclature for Cultivated Plants (ICNCP or Cultivated Plant Code) as adopted by the International Union of Biological Sciences International Commission for the Nomenclature of Cultivated Plants. With access to the registration database via irisregister.com you will be able to check registration and introduction information of irises online -- lots of details that you won't to miss. More information on Registration and Introductions here. Click on Join E-membership to become an E-member online. The good news is that no matter where you are in the world, you can now read our quarterly publication online as soon as it's ready and enjoy all of the fantastic information on hybridizers' latest introductions, garden trends, news from the society, book reviews, convention updates, and much more as if you were receiving the Bulletin itself. Don't miss the next issue. Stay connected. Join the Conversation! 'Total Recall' is my best iris. It was created by Ben Hager, who hybridized just about every kind of iris you can think of. He contributed many beautiful reblooming irises to the world, and I grow a number of them. But 'Total Recall' beats them all. 'Total Recall' has wide, ruffled falls and does not mush up under sprinkler water. The buds have double sockets, so the bloom period lasts a long time. Each fan produces a stalk with flowers. The rhizomes grow out a bit from the mother rhizome, so the plants do not get crowded and the fans do not grow sideways. I have not divided this clump since it was planted in 2008 and I won't need to do it this year. and in fall. It will bloom into January. and again after the roses. Which iris is your best performer? Here's one of my favorite historic irises - 'Mexico', introduced in 1943 by Dr. Kleinsorge. Not the tallest or the most floriferous, but when it's blooming... Wow! 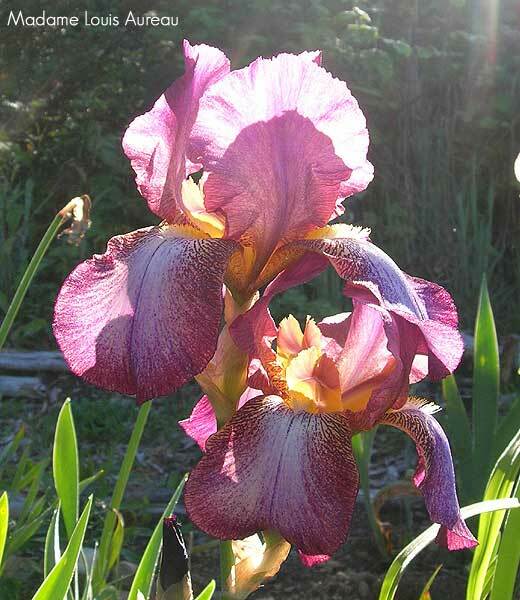 This was a favorite of hybridizers and is the parentage of many award winning and well loved irises. Dr. Kleinsorge used it heavily in his own breeding lines resulting in such beautiful varieties as 'Bryce Canyon', 'Alpine Glow', 'Cascade Splendor', 'Pretty Quadroon' and 'Voodoo'. Thru 'Cascade Splendor' there are even more beautiful varieties we can trace back to the genes in 'Mexico'. "Gay and brilliant, a blended bi-color of buff golden and broad plush-like falls of glowing red brown. Now there are many irises in this color combination, but this one is not the ordinary variegata type that you might expect. In the first place, it is a perfectly gigantic flower, with the falls slightly waved at the edges. And there is a coppery orange suffusion about it that makes it appear more as a blend than a definite bi-color. 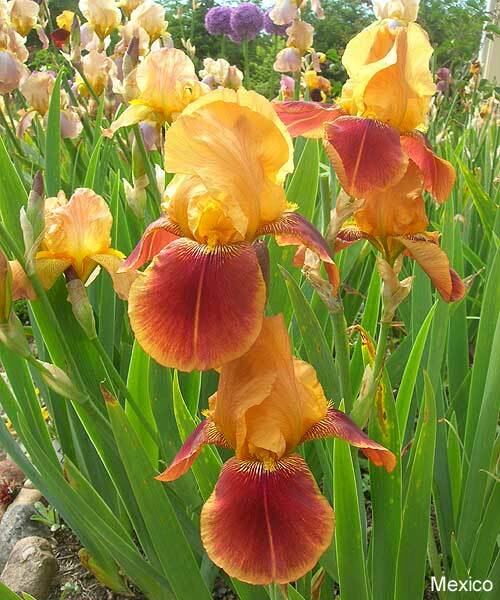 This is another of the very latest varieties, extending the iris season after most others have passed by." 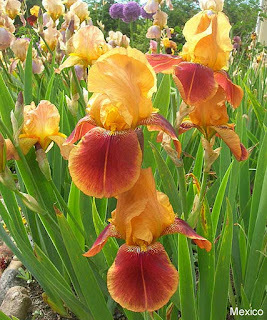 'Mexico' was an important parent in the history of modern irises and is well worth growing and enjoying even today. The warm, brilliant blossoms add such a bright note to the iris border. It's one of my favorites and I hope you've enjoyed learning a bit about it.